Every day, all over the world, drivers make extensive use of roadways and other transport infrastructures without considering the at time enormous costs that went into building these roads. Not all roads are built equal, however, and some have earned more consideration than others based on the sheer resources that went into their construction. In this article, we will be highlighting some of the most costly roadways in the world. At a cost of 30.1 billion krones (roughly 5.7 billion US dollars), many civil engineers count the Oresund Bridge and Road Complex the world’s most expensive roadway, even though most of its cost went into building the bridge itself. Completed in 2010, the Oresund Bridge effectively connects Denmark and Sweden across the Oresund Strait, and measures a total of 7845 meters, making it the longest road and rail bridge system in Europe. The Oresund Bridge received an International Association for Bridge and Structural Engineering award for Outstanding Structure engineering in 2002. Singapore’s tenth and most expensive expressway, the Marina Coastal Expressway was completed on the 28th December, 2013, at the cost of 4.3 billion Singapore Dollars (US $3.4 billion). 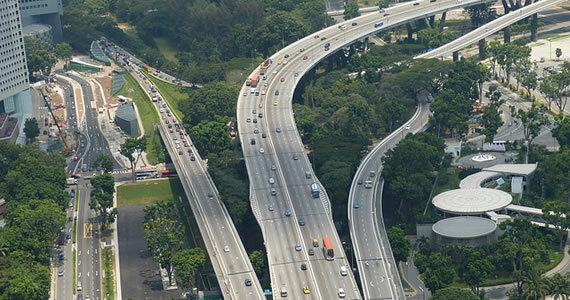 Although only 3 miles long, the roadway is particularly broad for a road in Singapore, at a breadth of five lanes, and stretches over a particularly difficult coastal area. Construction even involved undersea dredging to avoid conflicts with Singapore’s many canals, as contract engineers working on other highways experienced. A freeway currently partially complete, the Tehran-Shomal (literally, "Tehran North") freeway is undergoing extensive renovations and extensions, costing 452 billion rial ($1.7 US) to complete. The roadway connects the city of Tehran to a number of locations in Western Mazandarin, enabling crucial economic opportunities for the rural populations there. Currently, roughly half of the 75 mile freeway is open for commuters, with construction of the other half being stalled due to complications with contractors. As these roadways show, cost doesn’t always equate to size when it comes to roadways. Oftentimes, outside circumstances, as well as the difficulty of the terrain, have a far greater effect on the total cost of the roadways. So next time you’re driving along a highway, spend a moment considering just how difficult, expensive, and monumental an achievement developing such a structure is and how many people it took to get it all done. ← New or Used: What’s Your Best Option for a First Car?